The term's popularity on Google suggests more Hispanics are planning to vote. Latinas are leading the charge. This is no classic Bronx tale. The creator of a Latino Victory Fund video was once chased by bigots in a pickup. Kansas Official Thinks Millions Of Non-Citizens Could Have Voted. It Took Him Two Years To Convict Just One. There are over 1.7 million registered voters in the state. President-elect Trump must govern differently than he campaigned, including dropping the nativist rhetoric, leaving anti-immigrant campaign advisors outside his Administration, and altering policy proposal. The exit poll reports of the Latino vote are profoundly and demonstrably incorrect. For the past eight years, America has had an African-American president. Faced with the prospect of a white woman succeeding him, America instead just elected an angry white man as president. Call it the triumph of angry white men everywhere. Quick! 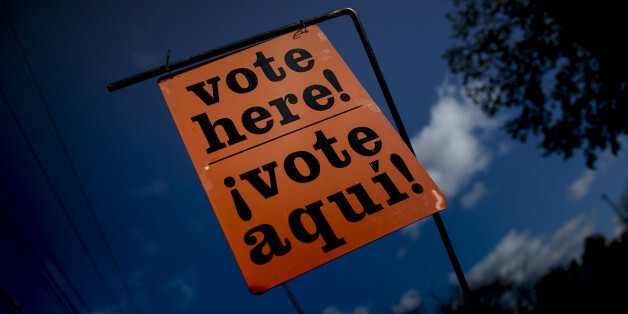 Who has inspired, unified and mobilized Latino voters with the greatest historical impact? Nope, not brilliant strategists in DC. No, not any new-fangled technology to reach voters more efficiently. It's not even the tireless work of indefatigable canvassers. Women & Minorities Can Take Down Trump on November 8. But Will They Actually Vote? Don't Give Up. Don't Give In. The Latino Vote Counts. In the end, it is not about organizations or ground operations or town halls or messaging. It is about the voter. Each of us has one vote, the moment is here to make it count! From Colombia to El Salvador, Mexico to Los Angeles, it is impossible to ignore the legacy of death, destruction and destabilization that the drug war has had in Latin America and in U.S. Latino communities. Currently, there are 6.1 million voters who are disenfranchised because of a felony conviction. That number is more than five times greater than in the 1970s and almost twice as great as the number of disenfranchised voters in the late 1990s. We need to ask our fellow Americans if what we have seen in this election is really who we are and who we want to be. Florida Moving Faster From Battleground To Blue? Thanks, Donald. A surge in Latino votes could spell long-term trouble for Republicans for years to come.